A family legend brings Aimee Mikkelson to the Grand Hotel on Michigan's Mackinac Island. As she seeks to uncover a hidden inheritance, Aimee's carefree nature hits a wall of organization - Mr. Dillon Thurough. Now her mission is two-fold: Recover the treasure and help Dillon break out of his routine. Dillon Thurough hates surprises. As one of the Grand Hotel's assistant managers, he has a one-, five-, and ten-year plan, and the free-spirited Ms. Mikkelson doesn't fit into any of them. Yet somehow, her ways are getting to him. As they work together to follow the antiquated clues, could Aimee and Dillon also be following the Lord's map to romance? Fall in love with this inspiring love story and our entire collection of Christian romance novels from Heartsong Presents! 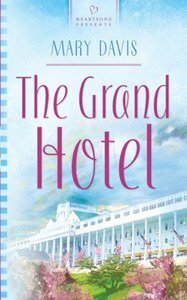 About "The Grand Hotel (Michigan Wedding #03) (#682 in Heartsong Series)"